Is the BOC Really Still Hawkish? 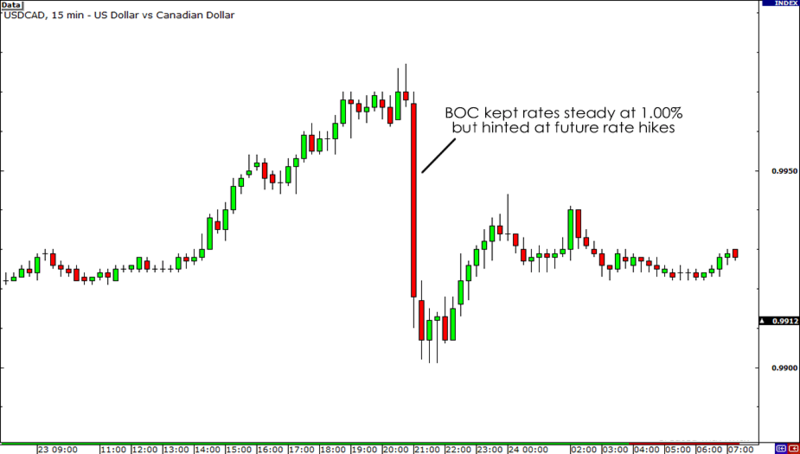 Instead of donning on dovish feathers in its latest monetary policy decision, the Bank of Canada (BOC) caused a heart attack among the Loonie bears when it kept its rates steady at 1.00% and hinted at future interest rate hikes. Talk about going against the trend! If you recall, other G7 central banks are all bent on pumping more stimulus in their respective economies. The Fed is busy printing money for QE3; the ECB is trying to save Spain with its OMT program; the RBA just cut its rates, and the BOE and BOJ are also thinking of adding to their stimulus programs! On the domestic front, the BOC expects exports to remain weak and housing activity to continue to slow down and retreat from its record highs. In fact, due to all these factors, Canadian central bankers don’t expect the economy to go back into full capacity until the end of 2013. There were a couple of remarks that made yesterday’s statement really interesting though. First, the BOC upwardly revised its growth forecasts. Back in July, the central bank estimated that growth for 2012 would only come in at around 2.1% but after making some adjustments, the bank now sees the economy to expand by 2.2%. On the other hand, it kept its forecast for 2013 steady at 2.3% and sees growth to come in at 2.5% in 2014 after initially predicting it at 2.4%. Although the revisions are marginal, they still came as a surprise to markets especially after BOC Governor Mark Carney hinted last week that the bank sees slower growth in the coming months. Second and more importantly, the BOC continued to say that it would soon withdraw some of its stimulus measures. For the most part, the BOC seems to be worried about the growing debt obligations of Canadians. Word around the hood is, Canadian household debt was 163.3% of income in the second quarter of the year. The figure must have raised the eyebrows of central bankers, causing them worry that a wave of personal bankruptcies as well as foreclosures could soon haunt Canada’s banking system. By raising rates, however, the BOC would give consumers a reason to limit their shopaholic ways and spend within their means by making borrowing costs more expensive. Consequently, the Loonie rallied following the rate statement. USD/CAD fell almost 70 pips to around the major .9900 handle following its release. Do all these mean that we’ll continue to see USD/CAD trading lower? Err, I wouldn’t get too excited if I were you. Some analysts say that the BOC was actually LESS hawkish yesterday than it was in its previous rate statements. As I said, the bank said that it expects the economy to grow back to full capacity at the end of 2013. I reviewed the BOC’s past statements and found out that Carney actually said that they expect Canada going back to full capacity in the second half of 2013. Of course, I could be over-analyzing his choice of words but a little caution shouldn’t hurt. The way I see it, yesterday’s rate statement implies that the BOC is still thinking about hiking rates but they won’t happen anytime soon. Do you think the bullish effect of BOC’s rate statement will last on the Loonie?